"He shares something that would change the world if only every person who believe in Jesus would actually do it." 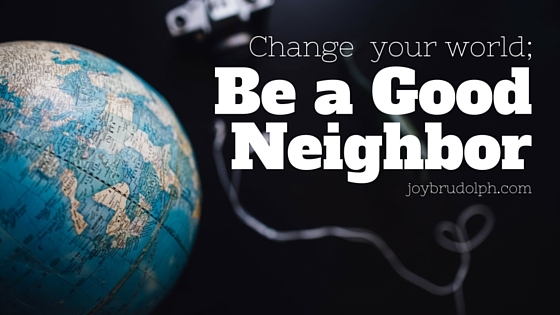 Perhaps just reading those words, "be a good neighbor," terrifies you. Maybe you're an introvert. Maybe you say "my neighbors are mean/smelly/weird/scary." Yeah, me too, to all of the above. 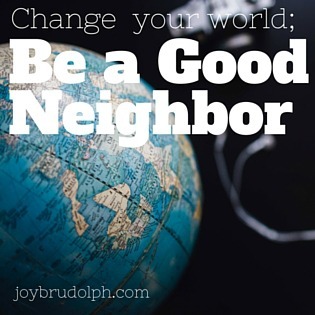 I have been imperfectly practicing being a good neighbor for the last several years. I know what it's like to innitiate a conversation when you're an introvert. I know what it's like to fail at neighboring. And what it's like to succeed. Over the next 31 days we'll take a journey to changing the world right where we are, in our own neighborhoods. I'll share real life examples, encouragement, and practical tips for being a good neighbor. 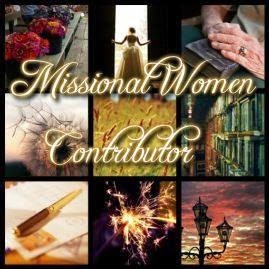 I also have some exciting guest posts and a giveaway planned. I hope you'll join me on this journey as we seek to live out the Great Commandment. Subscribe below via email and never miss a post. If you'll be following along I'd love to hear from you in the comments below. Day 29: Discipling Your Neighbors and a Giveaway! This series is part of #Write31Days. Click here to read other topics or join in.